According to thewho.net website, Townshend used Fender Princeton Reverb amplifier. 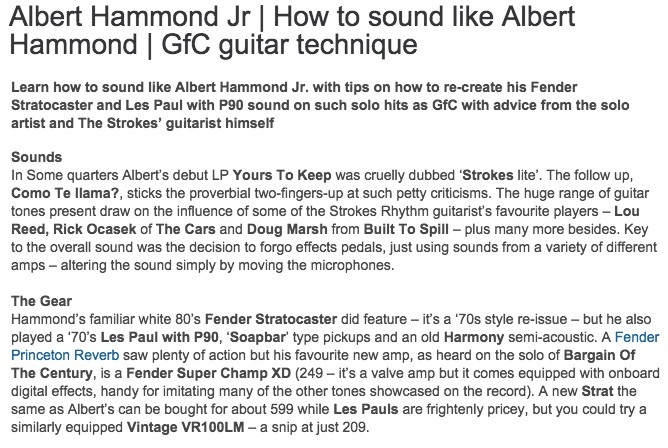 "A Fender Princeton Reverb saw plenty of action" - [*Guitar-Bass.net*](http://www.guitar-bass.net/news/albert-hammond-jr-how-to-sound-like-albert-hammond-gfc-guitar-technique/). Guitar Player's *50 Kings of Tone* article included details on the rig through which he achieved epic his trademark tone as guitarist to the post Led Zepplin efforts of Robert Plant. "Blunt used his 1956 Strat (which sported a 1954 neck) and a Fender Princeton Reverb to create the clanging single-note lines, lazy bends and double-stop stabs that would become his trademark." In this interview with "The Dumbing of America", Kevin McKeown recalls the usage of the 1957 Fender Princeton Reverb. "I played a [’67 Harmony Bobkat](http://equipboard.com/items/1967-harmony-bobkat-electric-guitar) through a [Death by Audio Interstellar Overdriver Supreme](http://equipboard.com/items/death-by-audio-interstellar-overdriver-supreme) pedal, usually straight into a late-’70s Fender Princeton— not lots of pedals, more driving the amp pretty hard." – St. Vincent, via an [interview](http://www.guitarplayer.com/miscellaneous/1139/st-vincent/21680) with GuitarPlayer. Fender Princeton Reverb was included in James' "gear list" in 2015 Premier Guitar article. Carl Broemel provides his list of gear to Guitar World while discussing the album "The Waterfall" from his band, My Morning Jacket. "I have a Princeton Silverface reissue. I also use a Big Trees by Audio Kitchen. It has two outputs, so it can be used in line, like a distortion pedal, or as [2.5 watt] amp itself. I’ll connect it directly to the speaker sometimes, or just use it like a stompbox. It uses a couple of tubes, sounds like a refined Marshall, and the box is painted by his daughter. Each one is different. Mine has a stick figure the owner of the company, Steve, and me on it. I first saw (producer) Alan Moulder using one. That and the Princeton give me versatility. I prefer amp distortion over pedals, so this takes care of that." For "Easter Sunday, " which was recorded on Easter Sunday, 1983, in Toronto, Fripp improvised with a Roland GR-700 synthesizer, and soloed on top of that with a Takamine acoustic, followed by a Les Paul with a fuzz box played through a Fender Princeton amp. Tom talking about dreamcar and the tone he used "A lot of the sounds started with a Fender Princeton model that had a really clean and chime-y tone. Then, I’d heavily compress the signal with a Kemper compressor, and I’d also plug in an old Ibanez chorus. Another patch we used a lot was called Walking Moon. It had a swirly, saturated lead sound." Visible behind Joe in this interview with Marty Music. At 22:39, a vintage Silverface model logo can be seen to the right of Joe's knee. > For sale from the official Nils Lofgren Reverb Shop is a vintage blackface Fender Princeton Reverb. Nils picked this amp up in the '70s and would bring it along to play with a friend's rockabilly trio at Moose Lodges and VFWs. > The amp is fully functional and has a small switch mod by the input jacks. It's listed in Fair condition because the reverb and vibrato do not turn off and the footswitch is broken. 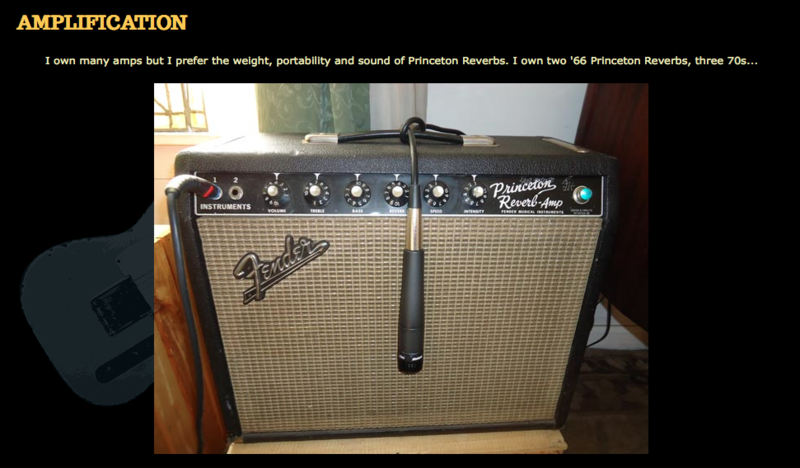 "I own many amps but I prefer the weight, portability and sound of Princeton Reverbs. I own two '66 Princeton Reverbs, three 70s," Jim Campilongo says, on his [official website](http://www.jimcampilongo.com/about/gear.php). According to Strymon's pedalboard feature article, Gavin uses the 1966 Fender Princeton Reverb amp. Grace Potter, after identifying a Fender Vibrolux, comments on its going "in and out of commission". So, she says that she uses a Fender Princeton Reverb amp. According to Premier Guitar's article, Zedek uses Fender Princeton Reverb combo amplifier. 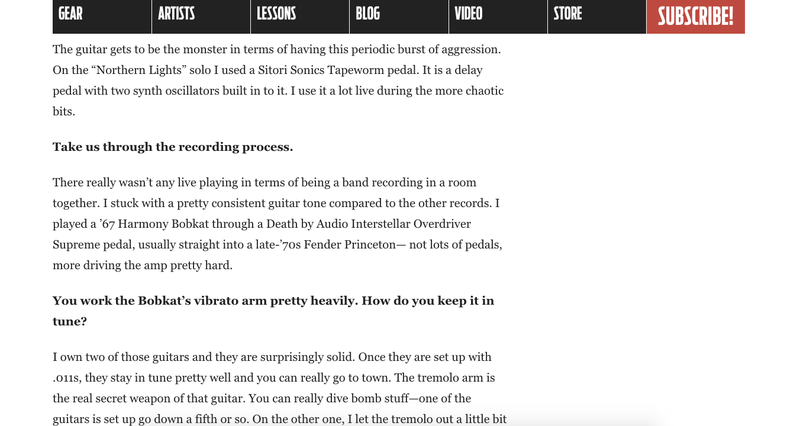 According to the Premier Guitar's interview with Valerie June, her "gear list" also includes the Fender Princeton Reverb. Rob can be seen and heard playing through this amp in this video of his set at NAMM. In this photo, Elvis appears to own 1968 Fender Silverface Princeton Reverb-Amp. I used it on a blues track with Cassandra Wilson, and it was like playing through an old Fender Princeton. Rock guitarists didn’t invent distortion— some sitar player invented it a thousand years ago [laughs]. Our ears and bodies have always loved the complex harmonic overtones of stuff that buzzes. Ben mentions in the article that he often uses this amp. In november 2016 Kiwanuka used this Silverface Fender during his Europe tour. In this article Bill Frisell’s gear is explained. Tyler mentions this amp in the article. He loaded it with a 12" Eminence Redcoat speaker for the Wild Child record. For the record he also set the volume and tone controls at about 6 or so and just left them there. According to his Instagram, this is his favorite amp. He used it during the sessions for "Cautionary Tale". During its long and storied run the princeton line of amps with 2 band tone controls udnerwent few significant revisions. Fender played fast and loose with the use of 5AR4 or 5U4 rectifier tubes as evidenced by exampels with originals tube sintact with tube charts that do not match the factoryisntalled rectifier tube! The effect on the response of a 12 watt amp is very subtle at anything less than full volume and the tubes can be interchanged freely if you have both types and a bias adjustment will probably not even be needed. The other significant change came during the silverface CBS period when the volume pot was converted to a push-pull gain boost. Most people ignore this feature. Every other change had to do with the layout of the circuit. CBS made changes to all of the amps to streamline production. These changes defintiely icnreased the noise floor but its debatable whether they influence the sound of the amp. Fender also varied OEM speakers a lot during the 60s and 70s. While many will claim jensen was the original OEM for a princeton it seems to vary from year to year with OEM ceramic 10" speakers being supplied by Oxford, Utah and later CTS and Eminence. This was my 1st amp. Not my 1st tube amp, my 1st amp. It was given to me by one of my uncles who is primarily a classical guitarist. At first I played it with my 1st guitar, an mij squire strat. Classic 60s tones. Fender Princeton Reverbs feature 1 channel with volume, treble, bass, trem speed, trem intensity and reverb controls. The 2 effects can be controlled via the classic 2 button footswitch with an RCA jack. The back features a courtesy outlet for another amp or whatever (but its non-polarized with no ground pin) and an external speaker jack to add a 2nd cab for more projection. The preamp is classic blackface 2 band EQ like channel 1 on a bandmaster head feeding a cathodyne phase inverter instead of a long-tailed pair that keeps the preamp tube count down to 3 12ax7es (2 stages for preamplification, 1 stage trem oscillator for the swampy bias-vary tremolo, 1 stage phase inverter, and 2 stages for reverb drive and recovery). The amp runs 2 6V6 tubes in fixed bias for a respectable 15 watts of clean tone through a 10" speaker (the PI structure probably cuts the wattage a bit, but its part of the sound) and she is tube rectified. The tube chart calls for a 5U4 rectifier (which is way overspec for a 15 watter, Leo was the man), but mine had the stock RCA rectifier, the robust and manly GZ34 (that can easily power a 40 watt amp with only a hint of tasteful sag). I have seen many 60s Princetons and they always have a GZ34, whereas the silverface ones have 5U4s. This amp is almost a single channel deluxe reverb, but the difference in the style of tremolo phase inverter and plate voltage on the 6V6es give this fender a softer, touch sensitive sound and feel that's closer to the brownface amps preceeding it. This was my only amp from '92 to around '99 and remained my go-to until '02. I paid my dues, jazz, rock and blues on this little demon. I particularly liked it paired with a Guild SF1 or my Carvin sh225. I pretty much ran her right at the edge of overdrive in all scenarios with both tone controls around 5 and then added drive and level with a conservatively set tubescreamer (at 1st a TS5, later a TS9). A guy I was in a rock band with collects all different princetons from brownface to silverface chasing my old sound. Go figure. Mine had an alnico JBL speaker installed by the guy who sold it to my family (who I know personally, what a crazy, awesome dude). Stock it had an oxford, so I was happy to have the JBL. The story goes that this cat who installed the JBL had done some tech work for Blood Sweat & Tears and wasn't paid, so he swiped this from the guitrarist in payment. Being a bassist he didn't want to keep it, so he upgraded the speaker and gave it to my dad who promptly sold it to my uncle. Then I was born and the rest is history. In the blackface line I feel there are no amps sweeter than the princetons. Being older and wiser I now know that the non-reverb models sound better. The reverb bogs the circuit down. Unless you are a die hard Fender surfy reverb fanatic (and don't have scratch for a Fender outboard reverb), get a non-reverb. They are cheaper and better. Ask Mike Campbell of Tom Petty's Heartbreakers. I do not recommend turning this amp way up into distortion. As you get her past a semi-dirty tone she exhibits the boxy and ill-defined power-amp saturation that most blackface amps have. The dimed small amp thing is not her forte because she is not built or voiced like a small, student amp. If you want that sound get a tweed deluxe or Gibson equivalent (like the ga14 or ga6).That said, her edge-of-breakup tones are to die for and the clean sound is pure 1960s Americana. Through a larger cabinet wired for 8 ohms she can keep up with a drummer set dead clean (unless you have really hot tubes in V1 and V2). I used to keep a handful of different tubes with me for V1 (12au7, 12at7, 12ax7 and super hot European ecc83 ax7 varieties) to vary my gain for each gig. Also, the bias vary trem on this amp (erroneously termed vibrato by fender) is to die for. This is the tweed tremolux and vibrolux sound you have heard so much about. In fact, the preceeding brownface and white knob princetons with their single tone control are direct descenats of those late 50s tweeds with trem. Pretty much any version of the Princeton from 1960/61 until about 1981 (when Rivera added lame-o overdrive circuits to everything and put a 2 after their model names... GAAAAH! damn you mooooooother-FUCKER!) is a total winner and you should buy one if you see one for under a grand these days. I thought I didn't need to include in the review that this amp was virtually indestructible. It only went down once in 10 years when the ORIGINAL blackplate RCA 6V6es from 1960-whatever finally got weak and then started to cut out. The amp was still technically working, it just lost headroom, definition and had some randome volume drops and crackles. The actual circuit Rand from the mid-60s until the mid-2000s with virtually no maintenance (there was a power tube swap and rebias). This amp just kept trying to work and succeeded no matter what kind of abuse I threw at it. And I got her as a pre-teen, so you can imagine my lack of knowledge and respect at first. The reissues fix a lot of original issues like notoriously violent and unpredictable volume taper. Don't let the wattage fool you, this thing bites back! I've struggled to find a gig this won't serve, certainly given a quality PA with good monitoring. This, for practical reasons, though has now become a home/studio amp. Given shipping expenses, I largely go out with a digital rig now, but there are times I long for this little baby to be shouting at me from the backline. It's one of those amps where you go direct with your guitar, dial in some reverb and just let the notes ring. It's a delight. More people should use this amp! It has some of the smoothest cleans I've ever heard and takes pedals brilliantly. Can't say enough great things about the princeton! Ryan Adams on why he plays a Princeton! Best amp ever! Best amp ever! Best amp ever! My 1st amp was a '64 Princeton reverb and I miss it. Maybe not the best amp ever but one of the greats for sure and without a doubt the best sounding blackface fender amp unless you need to be really loud and stay clean and/or you don't care for reverb (then I give it to the non-reverb princetons which are a bit more lively and the brownface deluxe which has better harmonic content and midrange). Jim Campilongo is one of my favourite guitarists and mainly plats Fender Princeton Reverb amps with Telecasters. I got this amp after deciding to downsize from my 60 watt 2x12 Fender Hot Rod Deville. The 68' custom shop Princeton Reverb RI is without a doubt the cleanest amp I have ever played and is also by far the most responsive to my guitar's volume, and subtle variations in playing dynamics. VERY strongly recommend this amp to the guitar player that wishes to have a great sound for anything from country, to jazz, and yes, even metal. It's also got modern tweaks that eliminate noise and plays well with my large pedalboard.